The field of surveillance studies is growing at a rapid rate, fuelled by a growing interest in the questions that lie at its heart and a deep unease about the future of individual privacy. What information is held about us, to what extent that information is secure, how new technologies ought to be regulated, and how developments in surveillance will affect our ordinary and everyday lives? Deliberately multi-disciplinary in character, this book examines these questions from the perspective of a broad range of fields, including sociology, management research, law, literary analysis and internet studies. As privacy comes under increasing threat and surveillance activities grow in quantity and diversity, so too the academic field needs to develop in new directions, form new perspectives, and gain new insights. In keeping with this aim, the chapters of this book consider how individuals, organisations, and states are engaged in the compilation, mobilization, scrutiny and use of ever increasing amounts of information. 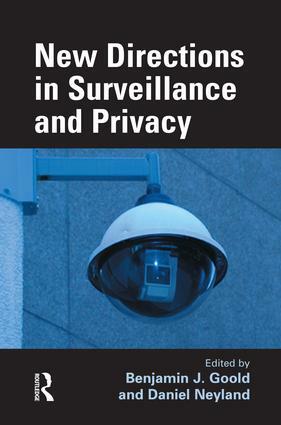 Divided into three sections focusing in turn on legal regulation, technologies of surveillance, and the future of privacy and surveillance, this collection provides a unique and eclectic insight into the question of how the spread of surveillance is changing our lives and the societies in which we live. From targeted to mass surveillance: is the EU Data Retention Directive a necessary measure or an unjustiﬁed threat to privacy?